The book tells the story of Valentino Achak Deng, one of the Lost Boys of the Sudan War, his many trials and hardships, first as an unaccompanied minor during the Sudanese civil war and then as a young man trying to make his way in America. It is an unforgetable book – both funny and heartbreaking at the same time. I am loving it. Last night, as I read the paragraph above, I literally felt a jolt in my chest. I have been feeling so horribly depressed the last several weeks. I think this is one of the worst bouts of depression I have ever had. I feel frozen in Jell-o some mornings, unable to move a single limb, let alone get out of bed. Somehow, I have managed to get up and get dressed and get something done each day – but not much. There has been a lot of crying, then laughing, then crying again. Over nothing. I have felt as if there is this werid and moving darkness around me. It feels like a threat – like something evil come to swallow me whole. 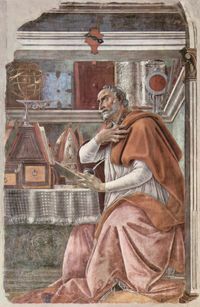 But when I read that passage last night, that prayer of Saint Augustine sent a bolt right through me. To my ears, it sounded like the cry of a soul in deep despair, a cry I could identify with. Its image of a light inside the heart made sense to me – it was something I could visualize and use to fight the darkness. And the description of the darkness as “my darkness” resonates with me, too. It is my darkness, created wholecloth by me and I am the only one who can overcome it – with some help through prayer, I hope. I immediately committed the prayer to memory and when I turned out the light a few moments later I said it over and over again in my head. 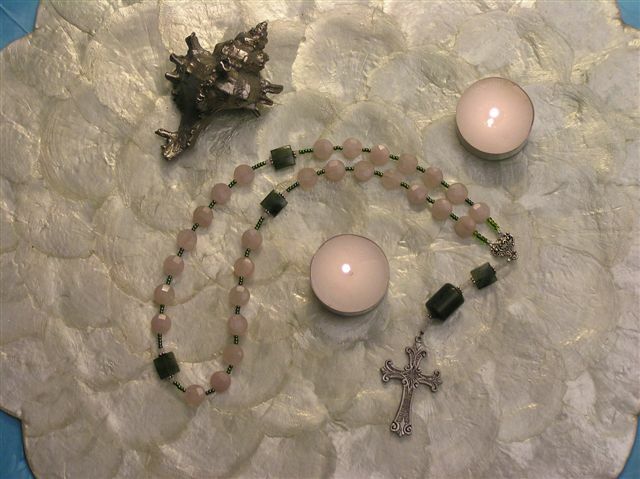 Today I am going to pray it on my prayer beads. It is like a beacon against the darkness – a darkness that may be all in my head, but feels all to real and dangerous. This morning I woke up with my usual holiday depression. It hits me every December – a general funk brought on by missing my loved ones who have died and others that I am separated from. The alarm went off and I just could not face getting out of bed, so back under the covers I went. I finally roused myself to get in the shower. It is a bright, crisp day here in Northern California, the kind of winter day that is so crystalline and clear you could bottle it and drink it as water. But even as the sun streamed in through the bathroom windows, I curled up on the floor of the shower. It’s an old trick of mine to battle depression – if I can make myself as small as possible then I can contain the hurt. It can’t overwhelm me. So as I lay there, I began to list all the things that make me blue. I won’t bore you with them, but suffice it to say the most depressing thing of all is that I have nothing to be depressed about. I am healthy, I am loved, I am not hungry and I have a roof over my head. But there I continued to lay, the water drumming down. In the name of the Father, the Son and the Holy Spirit. As it was in the begining, is now and ever shall be. Amen. I lift up my eyes to the hills – from where is my help to come? As I prayed, I kept my eyes on the scene outside my bedroom window. We live at the top of a hill and have a view of San Pablo Bay and the hills of Solano County beyond. As I prayed, I watched a hawk circle slowly above our street, I watched the sun twinkling off the tops of cars on a distant freeway, I watched a squirrel skitter along my neighbor’s fence, and I watched the few leaves left on our plum tree shimmy in the wind. With the beads slipping through my fingers, it seemed to me that I saw these things as if for the first time, my eyes really lingering on them and absorbing them fully. Soon, the negative thoughts that had been there with me since awakening began to fade. By the third time around the rosary, I felt myself breathing more deeply, I felt more calm, I felt less oppressed and more awake to what was going on around me. I felt more at ease inside my skin and inside my life. The main prayers I used today come from two sources. The cruciform prayer is from Psalm 121, v. 1-2. It is a Psalm titled “A Song of Ascents” in my bible – ascent being something I very much need when depression bites. It is a verse that reminds me that my fears and sorrows are really quite insignificant. The hills – God’s creation – are much bigger than anything I am or feel, and that as part of this creation, I am cared for and loved. And as I prayed it today, I could literally lift my eyes to the hills across the bay. What a gift! The prayer for the weeks beads was written by Julian of Norwich. It is among my favorite prayers because of its utter simplicity and because the rhythm it creates is soothing to me. It is almost a mantra. I can lose myself and my small worries in its simple assurance and committed optimism. I am not “cured” of my depression – prayer is not a cure, it is a comfort. But I feel better and can face the day.